Made my first set of audio cables yesterday! Thread: Made my first set of audio cables yesterday! Well, I've done it. 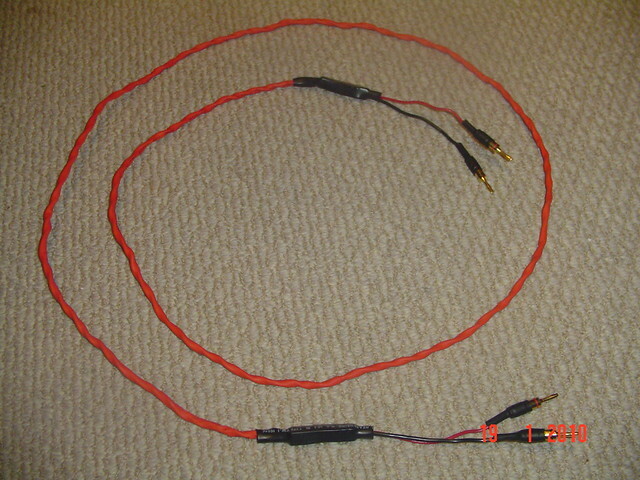 I finally bought most of the stuff I need to make my own cables and made my first set of speaker cables yesterday. I made them using 20 gauge fine (.999) silver round wire, clear Teflon tubing and some shrink tube. I didn't terminate the ends since I can go right into my posts as-is. They sound freaking fantastic! I swear there is more transparency and the highs are soooo clear and crisp. Also, I do believe that my mid range and bass have improved as well. Does anybody in earshot know if there is anything to this "break-in" period that the high end cable proponents suggest? I am hooked on this cable making crap. Up next is a set of rca interconnects. I am waiting for my $30 set of Dayton plugs to arrive. I am so excited that I already have the wire and Teflon cut. I still need a heat gun though, as I have been using the not-as-hot part of the solder iron to shrink my tube. If you are thinking about making your own cables- do it! 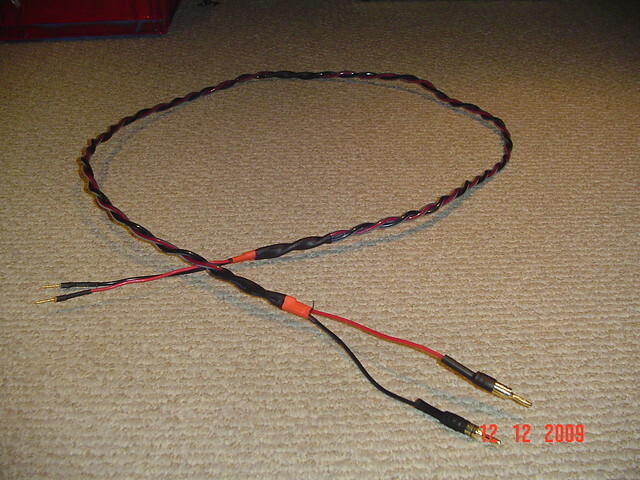 It's fun and you can make some kick-ars cables which rival or even match the $1,000 big boys! Have any photos of your work? My brother just ordered some materials for making cables and he is going to make me a couple of sets. He is very handy and a perfectionist so I am sure they will be a big improvement over my cheapie RCA's. Naw, my camera was stolen so no way to take pics. Be excited for the cables that your bro is going to be making for you! Make sure that you come back and tell us what you think! Oh, and if your camera doesn't wind up in some thief's hands I would love to see some pics as well! I still need a heat gun though, as I have been using the not-as-hot part of the solder iron to shrink my tube. Have you tried a blow dryer on high to shrink the tube? Yes, but I thought that it wouldn't be hot enough. Now that you confirmed the idea I will try it before spending $20. Thanks! Hair dyers work fine. You can use a low setting for the thin wall HS and a higher setting for thicker wall HS. Hell, I have even used a top burner on the stove. Whenever I have IC cables with Eichmann Bullet Plugs I use my toaster to expand the plugs. Then I run to install them before they cool off. Once contracted they have a serious grip on the rca plug. I enjoy making cables too. I use solid copper for mine. You're 100% correct in your assessment, the dynamics most definitely improve. A heat gun is the best tool but a dryer set to high will work, though not as good. Be careful at the stove not to over do it. Awesome! Your beautiful cables have inspired me and have given me ideas. I just ordered a larger length of shrink tube (white- I think it will look groovy) so I can shrink the whole mess of cables into one neat cable. Any tips on getting such an even twist even after sliding the shrink tube over the whole length? I want mine to look as professional as yours. My brother is going to be making me some cables so I will send him your pics for inspiration! I just pre-twisted my 4 leads for my interconnect project. I must say that the Dayton RCA plugs that I ordered are faaaaaaantastic even before putting them to use (I am waiting for my shrink tube to get here before I terminate the wires). I showed my gf, her two kids and my buddy how hefty and quality they are. They aren't the most expensive plugs out there (can you imagine spending $400 on a set of RCA plugs?) but the Law of Diminishing Marginal Utility has to kick in at some point and my mathematical "origin" is the $25 plugs that I bought . I will update sometime early next week when my shrink tube and bench vise arrive. Yeah, I have been pretty inventive with my duct tape and my pair of vice grips! The red pair were twisted and then covered in shrink. The trick is finding the right size of shrink wrap. It must be big enough to be able to slide the cables through (a real PITA), but not so big that it won't shrink snugly. The one thing with shrink is make sure you don't get greedy and over shrink. You then risk tearing the wrap and ruining the seal. There are no trade secrets, you are welcome to all that I know (not much). Did you make yours using the info on the sticky over on the DIY forum on AK or just come up with your own process? They are soley my own design and began based on materials availabe to me. I then began tweaking the design upon researching. For your gear kid, use higher guage wire as you will get better detail. Well, I have successfully completed my first set of RCA cables. They sound great! Listening to some Dan right now and the ride cymbal is just twinkling and singing like a crystal clear bell in their Aja track. Bass has tightened up considerably and the music just sounds more alive. I am waiting on my second (albeit different) set of Dayton Plugs so that I can go from my preamp to my amp. This first set went from my computer's sound card (that's right, it has RCA outs ) to my preamp. Can't wait for all my cabling to be solid silver (speaker wire was my first project). I have seen examples of this done but do not know about the sound quality of this cable myself just what people are saying that hear it but I have seen people take cat 5 network cable and braid the solid together and the same with the striped and I have even seen people take a few cat 5 cables and braid them together for a very big diy speaker cable. It would be a lot of work but I have heard that it sounds good and cat 5 cable is a little over 100 bucks for 1000 feet. Not a bad price if it would make good cable. If I had the time any more I would try it myself but I am getting ready to go back to school and get my bachelors degree in electrical engineering so I probably won't have much diy time any more to do these types of projects even though they still interest me. I thought cat5 sounded terrible.